e-commerce site for numismatic items. The Central Bank of Cyprus e-commerce site for numismatic items provides a regular and complete update of Cyprus’s numismatic issues as well as facilitates the purchase of collector coins and other numismatic items issued by the Bank. In addition to the euro coins issued for circulation within the framework of the Eurosystem, the Central Bank of Cyprus issues in limited quantities collector coins and sets. These numismatic items usually derive their themes from Cyprus’s cultural heritage, history and nature or are issued to commemorate important events, e.g. the accession of Cyprus to the euro area, Olympic Games, etc. The history of money in Cyprus began 2500 years ago when the first coin, which was silver, was minted in Cyprus in the 6th century BC. The historical development of money in Cyprus has followed the sometimes stormy and turbulent course of the island’s political history. The various conquerors that ruled Cyprus throughout its history introduced their own monetary unit to the island. Hence, among other monetary units, the stater, the obol, Roman and Byzantine coins, the gross, the dinar, the cartzi, the para, the piastre and the pound have been used as the island’s currency. In 1960, when Cyprus was declared independent and the Republic of Cyprus was established, the Cyprus pound became the country’s monetary unit. Initially, the pound was divided into 1.000 mils. In 1983 a new denomination, the cent, was introduced to replace the mil. The numismatic system remained the same as the Cyprus pound continued to be the Republic’s currency, the only difference being its denomination into 100 cent, instead of 1.000 mils. With the accession of Cyprus to the euro area on 1 January 2008, the euro has replaced the Cyprus pound as the Republic’s monetary unit. The Central Bank of Cyprus has issued in limited quantities collector sets of coins that have been or are currently circulating as well as a significant number of collector coins designed mainly by Cypriot artists. Thus there is a rich series of collector coins which covers important events such as the Olympic Games, the Third Millennium, the accession of Cyprus to the European Union and to the euro area as well as subjects related to the wildlife of Cyprus. 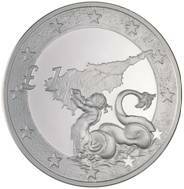 It should be mentioned that the collector coin issued to mark Cyprus’s accession to the European Union and which depicts Triton trumpeting through a sea shell the birth of Aphrodite, has received worldwide acclaim. It was awarded first prize in a competition held in 2005 at the Numismatic Exhibition of Vicenza in Italy, gaining the title “Finest Coin in the World minted in 2004”. Furthermore, it gained the title “Best Crown of the World” in a competition organised in 2006 by Krause Publications, publishers of World Coin News. During the first years of the Republic of Cyprus, the coins in circulation were those of the decimal system introduced by the British colonial administration in 1955. In 1963, shortly prior to the establishment of the Central Bank of Cyprus (CBC), the first coins of the Republic were issued by the Government through the Accountant General. They followed the decimal system introduced by the British in 1955, according to which the Cyprus pound was divided into 1000 mils. The denominations remained the same, except for the discontinuation of the 3 mils coin, the smallest denomination during the British administration, and the introduction of the 1 mil coin as the smallest denomination. Hence the denominations were 1 mil, 5, 25, 50 and 100 mils. With its establishment in June 1963, the CBC acquired the responsibility for the issue of currency. During the years that followed the Central Bank proceeded with several coin issues, initially in mils and later in cent. On 3 October 1983, the CBC, with the approval of the Council of Ministers, introduced the cent decimal system by which the Cyprus pound was divided into 100 cent. With this change, the CBC placed in circulation coins with nominal values of ½, 1, 2, 5, 10 and 20 cent. In October 1991, a 50 cent coin was introduced gradually replacing the banknote of the same value. Furthermore, in 1992 the ½ cent coin ceased to be legal tender and was withdrawn. 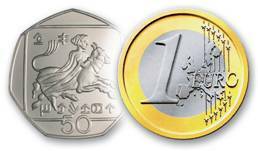 With the adoption of the euro on 1 January 2008, the Cyprus euro coins have replaced the Cyprus pound coins. The first notes of the Republic of Cyprus were issued in December 1961 by the Government, through the Accountant General, whose signature they bore. The notes were inscribed with the words “Republic of Cyprus” in Greek, Turkish and English. In December 1964, the Central Bank of Cyprus (CBC) issued the first banknotes that bore the signature of its Governor and the inscription “Central Bank of Cyprus” in Greek, Turkish and English. Until the end of March 1965, the notes introduced by the British colonial administration in 1955 circulated as legal tender, along with the notes of the Republic. Initially, the notes of the Republic of Cyprus had values of £5, £1, 500 mils and 250 mils. Additional denominations were introduced later. Thus the £10 note appeared in 1977, the 50 cent note in 1983 and the £20 note in 1992. With the introduction of the cent system in 1983, the 250 and 500 mils notes were withdrawn. The 250 mils note was replaced with the 20 cent coin, whereas the 500 mils note was replaced with the 50 cent note which was succeeded in 1991 by a coin. With Cyprus’s accession the euro area the Cyprus pound banknotes were replaced by the euro banknotes.